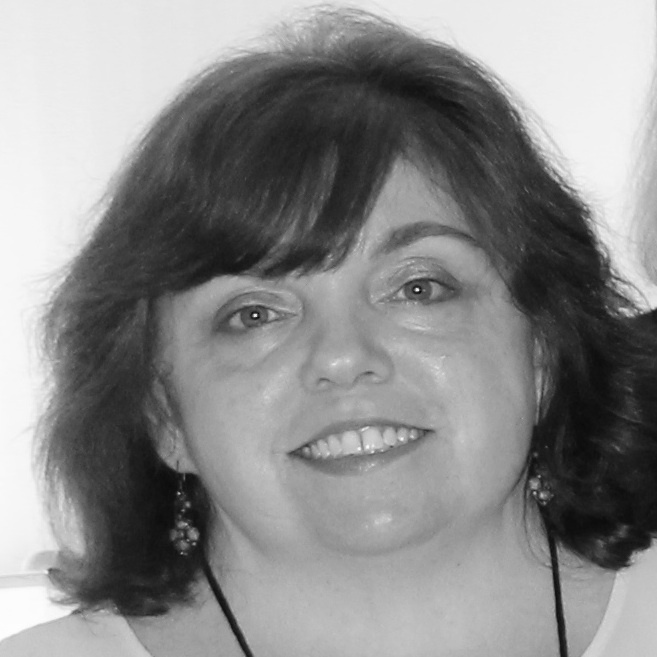 Edith Maxwell: We ate really well up in Maine at our Wicked Cozy retreat a few weeks ago. Here are some of our recipes! This picture shows me explaining the Saturday night dinner options. It was an unseasonably hot weekend, with temps in the nineties even on the Maine coast. I brought home-grown salad greens with soba noodles in Asian peanut-sauce, grilled chicken, and grilled shrimp to go on to, all cool or at room temperature. 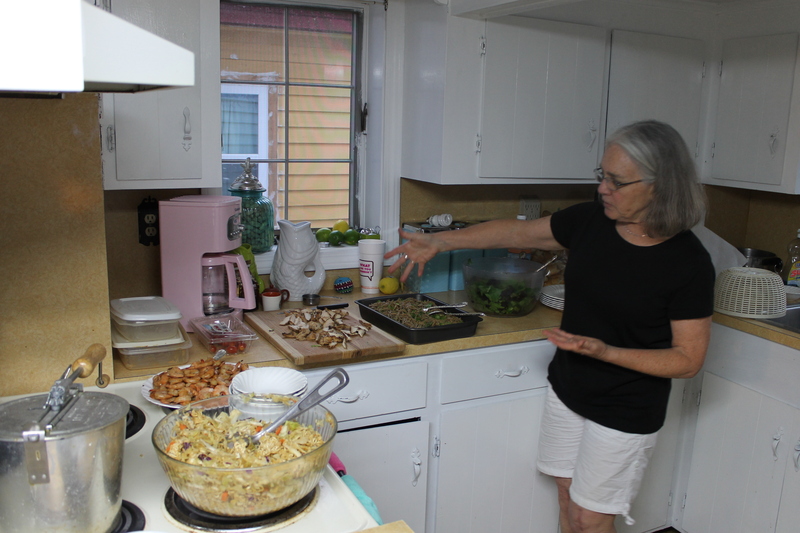 Julie contributed a crunchy Asian coleslaw that went perfectly. Here’s a recipe for the noodles. 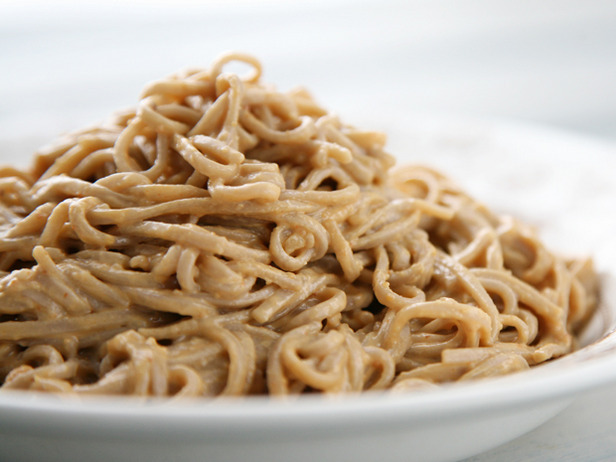 Cook the soba noodles, drain, and toss with 1 tsp sesame oil. Combine all other ingredients in food processor and blend until smooth. Taste and add more lime juice or hot sauce if desired, and additional water to make smooth if necessary. Toss the sauce with the noodles. Serve at room temperature on a bed of salad greens or shredded cabbage, topped with slivered snap peas, grilled hoisin chicken or shrimp, sauteed kale, or whatever you like! Note: Sauce is a version of a recipe appeared in the Boston Globe on May 29, 2013. Cheese fondue is the perfect food to feed guests when you are not sure exactly when they will arrive. Everything is easy to prepare at the last minute and almost everyone loves it. Ask your guests to help rip bread and cut up the other dippers while you assemble the fondue and dinner will be served in almost no time. In a biggish saucepan heat wine over medium heat until tiny bubbles form. 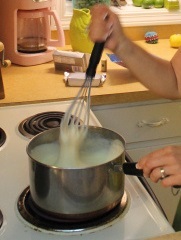 Whisk in 4 cups cheese, stirring constantly until it melts. Add cream cheese and whisk until melted. If the fondue is too thin, add more shredded cheese until it is thick enough to coat a bite sized piece of French bread. If it is too thick, slowly add more wine until it isn’t. This dish is best enjoyed with a large group of good friends. Any leftovers are wonderful served over pasta or warmed and tossed over a bowl full of broken pieces of toast and chunks of ripe tomato. Liz Mugavero: Well, I must confess I was the slacker of the group. I had no time to put together a meal of any sort (hey, if I was in charge of food all the time I would almost certainly starve) so I stopped at a lovely Hannaford’s in North Hampton, New Hampshire on the way to the retreat and picked up all the junk food a writer could want! Actually, it wasn’t all bad. I bought fruit and reduced fat chips and pretzels and wine. And coffee. And some cookies – hey, writers need fuel, right? Someone had to do it! But I must say the “real food” was absolutely amazing. I’m excited to get Julie’s breakfast potato casserole recipe today! Julie Hennrikus: I volunteered for a breakfast slot, mentioning a casserole. Barb said she’d take the second slot, and did I want to make sweet or savory. I chose savory. Since we had a vegetarian in the group, it was a little tricky, but I pulled it off with a new recipe. Who better to try food out on but your friends? 2 cups of shredded cheese. I used strong cheddar. OK, so here’s where I deviated. It also called for 1/2 cup of melted butter, which I skipped (added a little more sour cream). And it called for a topping of corn flakes (2 c) and melted butter (1/4 cup), which I also skipped, but only because I left the cornflakes off the shopping list. So I sprinkled with more cheese, and let it bake at 350 for about 45 minutes. Next time I am going to add broccoli. Barb used a family recipe for Creme Brulee French Toast. Not sure if this one is the same as Barb’s, but hers was delish. A note on this recipe–my friend David slices green apples along the bottom of the dish. Also delish. 2 packages of Ramen noodle soup. It calls for chicken, but I used Asian flavored. Crumble the noodles (they will get softer in the salad), and toss the rest of the ingredients together. 1/2 c vinegar. Cider is good, or rice vinegar is really good. Pout the dressing on, and put it in the refrigerator for at least a couple of hours. Overnight is best. And you can add other stuff–David suggested craisins, which would be fab. Old Orchard House of Pizza, (207) 934-4950 I ordered two awesome pizzas one a grilled chicken, broccoli, tomato and ricotta cheese. The other Grecian Supreme: spinach, feta, tomato, onion, garlic and Greek olives. The guy I ordered from assured me it would be an explosion of flavor in our mouths and it was! My desert came from Dolce Crema Cafe, 1 East Grand Ave. OOB ME 04064. I can order a mean pizza and pick out some excellent desserts. We all have our talents!